Blade was truly a remarkable animal. He was a breeze to train. He was very laid back around the house and very intent on the line. Blade was wonderful around children. He had a wonderful attitude and was always up for a good day of training. Blade was a natural marker on land and water. At the age of two, he had accumulated 13 Derby points in 10 trials. He also finished 7 out of 10 trials and Jammed his first and only Qualifying. He earned his first amateur placement as a 2nd at the age of 2. Blade had accumulated 14 all age points and was just shy of an FC and AFC by one win. 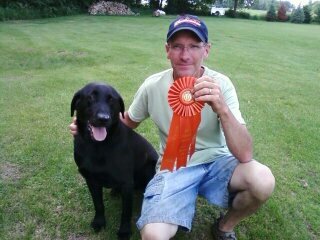 He was also 3 out of 3 in AKC MH passes. Blade had his share of retrieving ducks, geese and bumpers. He crossed the rainbow bridge the fall of 2015. We miss Blade, however, we see a part of him everyday in his offspring.